Avery Publishing Group, 9781592408498, 256pp. From the meatpacking plants that inspired Henry Ford's first moving assembly line to the "domino theory" that led America into Vietnam to the "bicycle for the mind" that Steve Jobs envisioned as the Macintosh computer, analogies have played a dynamic role in shaping the world around us and still do today. Analogies are far more complex than their SAT stereotype and lie at the very core of human cognition and creativity. Once we become aware of this, we start seeing them everywhere in ads, apps, political debates, legal arguments, logos, and euphemisms, to name just a few. At their very best, analogies inspire new ways of thinking, enable invention, and motivate people to action. Unfortunately, not every analogy that rings true "is" true. That's why, at their worst, analogies can deceive, manipulate, or mislead us into disaster. The challenge? Spotting the difference before it's too late. 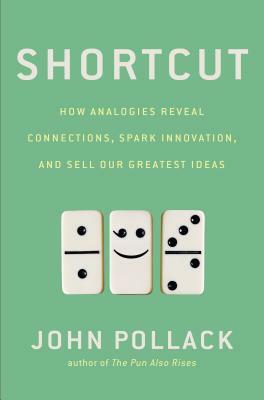 Rich with engaging stories, surprising examples, and a practical method to evaluate the truth or effectiveness of any analogy, "Shortcut" will improve critical thinking, enhance creativity, and offer readers a fresh approach to resolving some of today's most intractable challenges. John Pollack is the author of "Cork Boat" and "The Pun Also Rises. "In addition to working at The White House, John Pollack has spent more than a decade as a communications consultant for Fortune 100 companies and public-sector leaders. Earlier, he worked as a Capitol Hill speechwriter, foreign correspondent, and project manager at The Henry Ford a museum of American innovation. He lives in New York City." "He tells us, with a clarity unusual for the subject, how the mind works." "The best books on language are the ones that encourage us to reexamine what we think we know, and The Pun Also Rises . . . does exactly that." "Pollack’s . . . quest seems not merely charming but heroic." "Written in a style of singular grace and impact."